The Winnower | Why do persons from higher mean IQ populations do better even after selection? Why do persons from higher mean IQ populations do better even after selection? 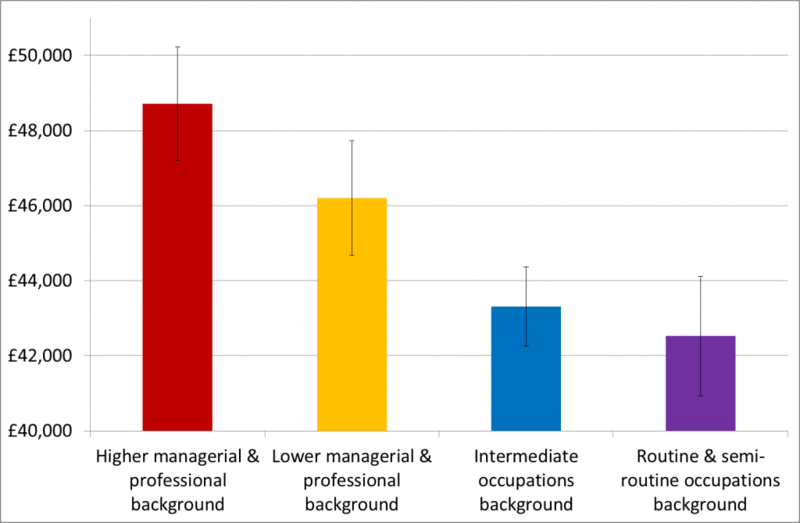 It has been found that workers who hail from higher socioeconomic classes have higher earnings even in the same profession. An environmental cause was offered as an explanation of this. I show that this effect is expected solely for statistical reasons. Friedman and Laurison (2015) offer data about the earnings of persons employed in the higher professions by their social class of origin. They find that those who originate from a higher social class earn more. I reproduce their figure below. In doing so, we have purposively borrowed the ‘glass ceiling’ concept developed by feminist scholars to explain the hidden barriers faced by women in the workplace. In a working paper recently published by LSE Sociology, we argue that it is also possible to identify a ‘class ceiling’ in Britain which is preventing the upwardly mobile from enjoying equivalent earnings to those from upper middle-class backgrounds. There is also a longer working paper by the same authors, but I did not read that. A link to it can be found in the previously mentioned source. How do persons advance to professions? Well, we know that the occupational hierarchy is basically a (general) cognitive ability hierarchy (GCA; Gottfredson, 1997), as well as presumably also one of various relevant non-cognitive traits such as being hard working/conscientiousness altho I am not familiar with a study of this. A simple way to model the situation is to think of it as a threshold system where no one below the given threshold gets into the profession and everybody above gets into it. This is of course not like reality. Reality does have a threshold which increases up the hierarchy. [Insert the figure from one of Gottfredson’s paper that shows the minimum IQ by occupation, but I can’t seem to locate it. Help!] The effect of GCA is probably more like a probabilistic function akin to the cumulative distribution function such that below a certain cognitive level, virtually no one from below that level is found. Simulating this is a bit complicated but we can approximate it reasonably by using a simple cut-off value, such that everybody above gets in, everybody below does not, see Gordon (1997) for a similar case with belief in conspiracy theories. We make three groups of origin with 90, 100, and 110 IQ. We simulate a large number (1e4) of random persons from these groups. We plot these to get an overview of the data. We find the subgroup of each group with IQ > 115, which we take as the minimum for some high level profession. 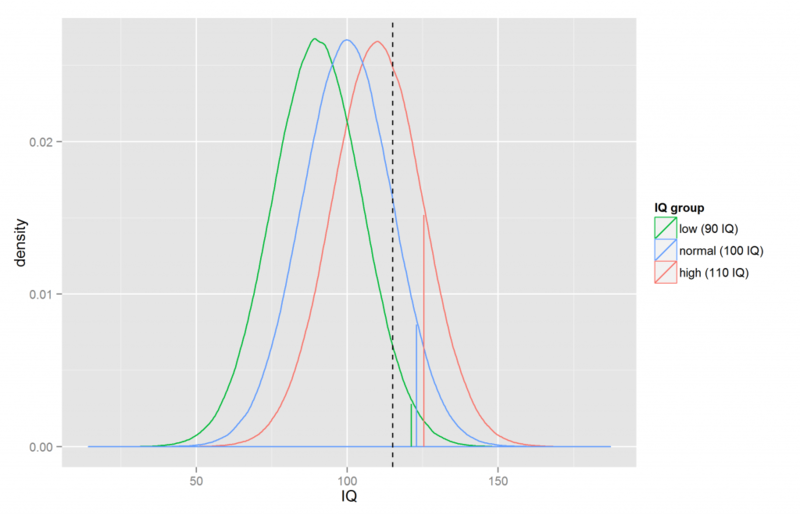 We calculate the mean IQ of each subgroup. The vertical lines are the cut-off threshold (black) and the three means (in their corresponding colors). As can be seen, the means in the subgroups are not the same despite the same threshold being applied. The values are respectively: 121.74, 122.96, and 125.33. The differences between these are not large for the present simulation, but they may be sufficient to bring about differences that are detectable in a large dataset. The values depend on how far the population mean is from the threshold and the standard deviation of the population (all 15 in the above simulation). The further away the threshold is from the mean, the closer the mean of the subgroup above the threshold will be to the threshold value. For subgroups far away, it will be nearly identical. For instance, the mean IQ of those with >=150 is about 153.94 (based on a sampling with 10e7 cases, mean 100, sd 15). It should be noted that if one also considers measurement error, this effect will be stronger, since persons from lower IQ groups regress further down. This is just to say that their initial IQs contained more measurement error. One can correct for this bias, but it is not often done (Jensen, 1980). R source code is available at the Open Science Framework repository. Friedman, S and Laurison, D. (2015). Introducing the ‘class’ ceiling. British Politics and Policy blog. Gordon, R. A. (1997). Everyday life as an intelligence test: Effects of intelligence and intelligence context. Intelligence, 24(1), 203-320.